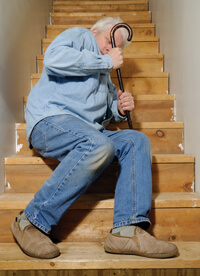 The U.S Congress reported in the Fall Prevention Act of 2003, falls are the leading cause of injury deaths among individuals who are over 65 years of age. The 65+ population will double by 2030. The 2003 Act found that, “A national approach to reducing elder falls, which focuses on the daily life of senior citizens in residential, institutional, and community settings is needed. The approach should include a wide range of organizations and individuals including family members, health care providers, social workers, architects, employers and others.” Since 2003, the U.S. Congress has funded education and research, enacted the Keeping Seniors Safe From Falls Act of 2005, and most recently the Safety of Seniors Act of 2007. As a result of the 2003 Act, Medicare now recommends that all Medicare patients receive an annual Fall Risk Assessment. At Franklin Rehabilitation, the assessment is just one part of a complete program to help reduce the risk of falls. Are You Afraid To Tell Your Doctor How Many Times You Really Fall Down? Research at Boston University has found that a major problem confining older people to their homes isn’t falling itself, but fear of falling (and letting their doctor and family know when they have). It turns out to be a bit of a surprise for the people’s children and their health professionals when they find out, because many elderly people don’t readily admit to it. When Performed By Trained Professionals, Fall Risk Assessments Are Simple, Painless, And Proven Effective For Recommending The Best Plan To Reduce Or Eliminate Fall Risk And The Debilitating Fear Of Falling. As part of your fall risk assessment and prevention planning program, it’s important to periodically review your symptoms and determine which ones may be due to medication. It’s extremely important to avoid mistaking any adverse symptoms you may be experiencing for normal aging when they may be more directly related to adverse drug side effects and interactions. Please do not stop taking any prescribed medication without consulting with your doctor. Many medications must be gradually weaned to avoid serious complications. 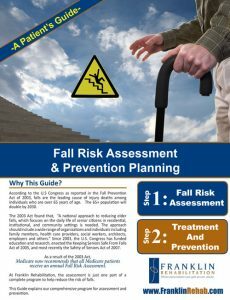 To learn more download our Patient’s guide: “Fall Risk Assessments and Prevention Planning” here.